If someone can make a $100 tablet that is awesome, it will sell like hotcakes sprinkled with fairy dust and deep-fried in freedom. But this is not that tablet. The IdeaTab A1000 is Lenovo's bargain-basement 7-inch Android offering, and its cheapness is glaring from the moment you pick it up. The A1000 starts at $129 and can be found on Amazon for just $105, but anyone considering it would be well-served to pick up a Kindle Fire HD for $159 or, even better, a Google Nexus 7 for $229. Though these models cost a little more, the user experience they provide is so much better that you'll spend more time with your tablet, and be happier doing it. As soon as you pick up the A1000 and press its wake button, you'll see that its weakness is its screen. With a resolution of 1024 by 600, its display has fewer pixels than the iPhone 5's does--on a 7-inch screen. The LCD panel seems pretty far away from the touch panel, too, leaving a visible gap between them. As a result, you feel as though you're touching not the touchscreen, but a piece of glass over the touchscreen. The range of acceptable viewing angles is beyond poor, and the glare is awful. Still, with the brightness cranked all the way up, reading in sunlight is possible, though a bit uncomfortable. A good tablet needs a good screen, since the screen is pretty much the only thing you interact with. If the screen is truly great, the rest of the tablet seems to fall away and you get the feeling that you're holding the content itself right in your hands. That pleasant sensation never happened to me with the A1000. The rest of the hardware feels similarly cheaply made. The A1000 is thicker and bulkier than the Nexus 7, and it has a bigger bezel, though no 7-inch tablet qualifies as truly "clunky." The little plastic flap over the MicroSD slot on the tablet's right side sometimes resists going back down nice and flush after you've pulled it up, which makes it feel flimsy. An identical flap on the opposite side covers a little hole where the SIM slot (supporting phone calls) would be if you had bought the tablet in India. But in North America, it's just an empty hole that you'll uncover time and time again thinking it's the MicroSD slot! Fun! Unlike Lenovo's $149 IdeaTab A2107, the A1000 lacks a back camera. It does have a front-facing camera for videochatting, and Lenovo includes the stock Android Camera app, in case you're desperate enough to use the 0.3-megapixel front camera for noisy stills or videos--but you really shouldn't bother. Using the A1000 isn't much more fun than looking at it. Performance ranges from slightly sluggish to head-smackingly slow. When you turn the tablet from portrait orientation to landscape, or vice versa, the sequence runs like this: First there's a delay, then the folder-style widgets disappear, then the wallpaper rotates, and then the tablet redraws the folders and icons. The process happens slowly enough for you to think to yourself, "Hey, why isn't it rotat--oh, there it goes." Every. Single. Time. The home-screen widgets are a ripoff of the unpopular skeuomorphic elements of iOS--the calendar widget has a torn-paper effect and a "turn pages here" curl that doesn't actually do anything. The notepad is yellow and has a pushpin and other pages peeking out from the back. The folder-style widgets (for Media, Social, and Tools) are extra-super-duper-double-plus aggravating because the icons inside are big enough to tap, so I found myself tapping on the one I wanted and then being annoyed because, instead of launching the app I had tapped, the software opened the whole folder, and I had to tap the app's icon again--for real, this time. Every. Single. Time. Fortunately, you can get rid of these default widgets and use regular Android folders instead. Downloading multiple apps slowed down the whole tablet. Scrolling through long pages of text was smooth enough, but occasionally I had to tap buttons toward the screen's edges three or four times before the tap registered. 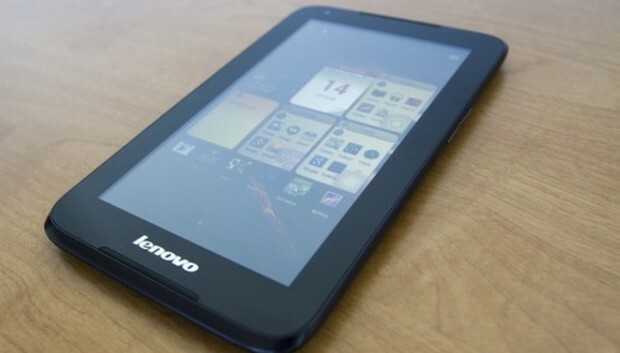 The tablet runs Android 4.1, which Lenovo didn't gunk up with too many dumb extras...or any cool, helpful extras either. Asphalt 7 took a while to load but played okay, as did the Unreal Engine showoff piece Epic Citadel, though its built-in benchmark averaged a mediocre 34.6 frames per second. But the poor screen is more annoying than the poky load times when you're trying to play games--especially tilt-controlled games, since the colors wash out as soon as you tilt the tablet. The A1000's biggest selling point, besides it low price, is its stereo speakers, which sound nice and loud. The audio output doesn't rival that of a higher-end Bluetooth speaker like the Jambox, but it's about as full and heavy as you'd get from portable capsule speakers. If you travel a lot and don't like to bring an extra travel speaker, this tablet might keep you entertained--if you can live with the 8GB or 16GB storage limits, keep some tunes on MicroSD cards (up to 32GB cards are supported), or have plentiful Wi-Fi for streaming. But the A1000 isn't a total entertainment package, since movies and TV shows suffer from the screen's poor viewing angles and general crumminess. The Dolby Digital Plus equalizer in the Settings app was a big disappointment, if by "disappointment" you mean "huge, colossal pile of fail." It has a big blue Dolby logo that you tap to turn the effect on and off. When it's on, the mids and highs come out more, and the music gets louder and fuller. When it's off, the bass stands out better, but the music sounds thinner overall. Below the logo is an impressive-looking equalizer--but every time I touched it, I got a message announcing that it works only with headphones, even when I had headphones plugged in. I tried four sets of headphones in the 3.5mm jack, and audio played through them just fine (and sounded sweet), but the equalizer refused to acknowledge their existence. I didn't mentioned some of the basic specs--1.2GHz dual-core chip, 1GB RAM, 3500mAh battery, Bluetooth 4.0--until now because, if you're concerned with specs, you probably aren't considering this tablet. Likewise, if you love games and movies, you probably aren't considering this tablet. If you just want a cheap Android tablet to have around, this one qualifies. But do yourself a favor and try to scrape up the extra Benjamin for a Nexus 7, which runs Android 4.3 (the A1000 runs 4.1) and sports a 1280-by-800-pixel IPS screen that's a squillion times better, give or take a couple of zeroes. Right now, the Nexus 7 is the best 7-inch tablet you can get. The A1000 is just frustrating in comparison.